Art and music can help calm, sooth, and heal patients and their families during a stressful time in their lives. The Cowell Family Cancer Center offers an abundance of both. Carefully-chosen local nature photography and other art on the walls of the cancer center help create a natural healing environment. The third floor Reflection Gallery features a large scale, permanent installation of original sculpture and interactive works. The Cowell Family Cancer Center is pleased to partner with Interlochen Arts Academy to bring art to the cancer center. The Aesthetics of Health Series is a rotating collection featuring nationally recognized artists on display at the cancer center. Art therapy helps people with physical and emotional problems by allowing them to express their emotions through creative activities. Art therapy includes programs for pediatric and adult patients. A bi-monthly, drop-in art therapy program is held on Friday mornings in the Infusion Suite for pediatric patients and their families to create art informally. This program is facilitated by a licensed art therapist and counselor, specializing in positive youth development and helping children and their caregivers cope with illness. Interlochen Arts Academy visual arts instructors and students, along with occasional support from the Great Lakes Children’s Museum staff, co-lead a monthly program, “Arts at the Cowell,” a drop-in art-making group for oncology patients and their caregivers and family members. “Production of a Collaborative, Interactive Work of Art” is being planned. 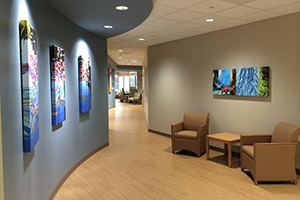 Interlochen art students and the Cowell Family Cancer Center community will create a large-scale installation to be exhibited at the Cowell Family Cancer Center and the Great Lakes Children’s Museum. These projects are open to all ages and will be abstract, but intuitive. This art is not skills based – it will be interactive, durable, and educational. The artwork will engage the body as a whole and be accessible to those with disabilities. Meeting and event times will be posted in advance. Various artists also are featured as exhibitors and presenters in the Cowell Wellness Initiative speaker series. Learn more about our partnership with Interlochen Arts Academy. Music therapy is offered by trained health care and music professionals who use music to promote healing and enhance quality of life. Music can provide stress relief, as well as opportunities for joy and healing for patients and caregivers. The Cowell Family Cancer Center features a variety of musicians with a compassionate presence. You may find a guitarist playing acoustic jazz, folk improvisation, or classical guitar music throughout the cancer center, including patient treatment areas. A guitarist or a harmonium player may provide music during yoga or meditation classes and workshops. Music therapy also is included in the Meditation Room with a Meditation in Music session. Music therapy includes guitar-songwriting workshops for pediatric infusion patients. A harp music therapist is available upon request to offer the intentional use of harp music to aid in the healing process. Sessions can be provided before, during, or after treatment. For more information on harp therapy, call 231-935-5070. Learn to listen and care for yourself through the strings of the harp. Participants are given the use of a small folk harp for this hands-on experiential group. The group is available upon interest of two or more participants, with a limit of four. For more information, call 231-935-5070. The Cowell Family Cancer Center and Interlochen Center for the Arts partnership includes visual art classes and lectures in the Third Floor Reflection Gallery taught by Interlochen faculty for Interlochen students. The community is welcome to watch. Visual art is created onsite involving drawing, painting, weaving, jewelry making, portrait sittings and includes collaborative projects with cancer center patients, staff, and community members. We look forward to adding book-making with Interlochen illustrators and creative writing for pediatric patients. Inspired by their cancer center experience, visual arts students work in their studios to create many other works (computer media, sculpture, fashion design, textiles, models). The student works are curated and exhibited in the Third Floor Reflection Gallery at the end of the year-long class and displayed over the summer months. During the school year, the partnership also includes a rotating display of internationally acclaimed art exhibits that are juried by Interlochen faculty. Periodic art receptions occur for exhibit openings. The public is welcome. This is the only rotating art exhibit within Munson Healthcare and is displayed in the cancer center’s Reflection Gallery. Interlochen also brings performance art to the cancer center, including pieces performed in the Sprout Café by the dance, theater, voice and music departments. The community is welcome to attend.